You are here: Home / DEBT / OUR Repayment Updates / We’re Debt-Free! –A behind-the-scenes look at our journey to pay off $144,000 of debt! We’re Debt-Free! –A behind-the-scenes look at our journey to pay off $144,000 of debt! “Shoot for the moon and even if you miss you’ll land among the stars.” That was my attitude when we set our goal to pay off over $130,000 of law school student loan debt. I wasn’t sure how it would happen, but I knew that by setting an audacious stretch goal we would end up in a much better place than if we had just tried hard. When we were deciding on our goal, we didn’t do so based on the numbers. I had suggested five years, but my husband said, “That’s too far away… Let’s say three years.” I was eager to be debt-free too, and the sooner, the better. And so in September 2013, we set our big goal to pay off all of our debt by the end of 2016 (a little more than three years). It looked very much impossible on paper. At the time, my husband was making $39,000 (pre-tax) and I was bringing in some side income with my Etsy shop. When I calculated how much we needed to pay each month to be on track to reach our goal on time, it was over $3,000, about the same as our total take-home pay! That is where faith comes in. We trusted that in those three years we would be able to find ways to increase our income. We have, and we have been blessed tremendously! If you read our last monthly budget update and you know how we make two payments each month, this will come as no surprise. Since we live on last month’s income, at the beginning of July all of our income from June became available to budget. In June, our income was the biggest it has ever been. We made our final debt payment at the beginning of July! We did it! We’re done! We are debt-free! Zero has never looked or felt so good! It’s pretty surreal. In total, we paid $144, 064. Because I think graphs are fun to look at, here are a couple I put together. If there are any others you’d like to see, just holler! The graph below shows our income each month along with the amount we paid in debt that month. Keep in mind that we live on last month’s income, so we use June’s income for July’s expenses/debt payment. The next graph shows our cumulative debt repayment over time. I like that steep slope over the last six or seven months. May 2012— Mr. SixFiguresUnder graduates with a JD and MBA (4 years of school) with debt totaling somewhere over $130,000. I don’t know the exact figure because I was afraid to look at the actual number back then. November 2012— We are on an income-based repayment plan so we don’t have any payments due, but we decided to pay off the smallest loan of $4,000 with money from a CD that had just come up for renewal and happened to be about the same size as the loan. At this point we are still saving for a house and planning to buy one before paying off student loan debt. May 2013— After reading The Total Money Makeover, which I found at the thrift store, we talk about changing our financial plans. We decide to make paying off student loans our financial priority even though we really (really) want to save for a house. We prove it by putting all the money we had earmarked for a down payment, over $17,000, toward our student loans. June 2013— We pay nearly $8,000 toward our loans after gathering together all the money we have sitting in different accounts. Some of it we have been holding onto since just after law school, since we weren’t sure if my husband’s job would be strictly commission or not. September 2013— I start Six Figures Under to document our debt repayment progress (and for a few other reasons). After setting our audacious goal, we decide to be totally transparent with our finances on the blog. December 2013— We make it to just five figures under! Hooray! March 2014— We start living on last month’s income, which is seriously a game-changer! You can get my free Guide to Getting a Month Ahead Financially when you subscribe to my newsletter. April 2015— We add a new little one to the family. We are now a family of six living in my in-laws’ basement. thankfully babies don’t cost much (but even if they did, they’re worth it)! June 2015— My husband’s income changes from a draw system, to strict commission (more about our change to variable income here). We also reach the point where our “debt paid” was finally more than our “debt remaining. September 2015– My husband changes jobs, moving from a small law firm to work for the state of California. He keeps some of his clients and starts his own law firm on the side so he can continue to take care of them. March 2016— We pass the six figures mark in debt paid! I’m sure there are many other highlights and milestones that I didn’t mention. It’s been quite a journey! And if you’re new here, please know that everyone’s journey will look different. Your journey won’t look just like ours, and that’s a good thing! How did we increase our income? I get lots of questions about what we did to increase our income during the time we paid off debt, so I filmed a little video to walk you through it. Or I have a post where I talk all about how to increase your income to pay off debt . Nearly three years ago I started Six Figures Under to document our paying off our student debt. I am SO GLAD I did. I’m truly humbled by all of your support. Besides a handful of family and friends who read here, I’ve never met any of you, yet you’ve cheered us on all the way. You’ve encouraged us and celebrated the milestones with us. That means more than you know! The accountability of having this public record read by all of you has also kept us in check! It might sound silly, but I really do think, “Would I be proud to tell my readers about [insert bad financial move]?” I don’t want to have to admit to going over budget or wasting money for something dumb, so I usually rethink things. We need to keep the momentum up. I think I’m even more excited about saving for a house than I was about paying off debt. It’s going to be another colossal goal thanks to the high housing prices in California. We’re still working out the details of our next goals, but you better believe I’ll let you know! If you’re wondering what we’re doing to celebrate, check out our plans for when we’re debt-free. So far we have new bikes and sleeping bags for the kids. Hopefully next weekend, we’ll take care of the grown up bikes. We’re so excited to have earned them before the summer is over! Are your working to pay off your debt too? If you’re just getting started, are running low on motivation, or don’t have a solid plan in place, check out my free 7-day course Smash Debt. It will walk you through the steps we went through to achieve our goal to be debt -free. It includes some printables to help you get organized, too! Want to get out of debt, but don't know where to start? This is just what you need! Sign up now and get immediate access to Day #1! Awesome! You are going to rock this! 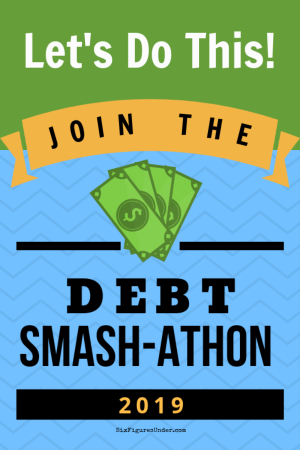 Step 1 of the Smash Debt course is soaring through cyberspace to land in your inbox momentarily. I'm excited for you to get started! CONGRATULATIONS!!! I am SO PROUD of YOU and YOUR FAMILY!! You have worked So Hard to get to this point and have been a huge source of inspiration for me. What actually struck a cord with me is realizing how long I’ve been following your blog!! Thank you for bringing me along on your journey! Congratulations guys, that’s fantastic and must feel amazing. I’m right at the beginning of the journey and struggling to get in a rhythm with it all but it’s so encouraging to follow your progress and be around when you’ve reached your goal. I’ve been following your inspiring journey for a while now, and I can’t help but stop and pass on a huge CONGRATULATIONS to you and your family! What an amazing accomplishment! Congratulations!!!! This is awesome new! I feel so much joy for you guys at the completion of this goal! It must feel wonderful to be done with this and know that you can accomplish anything as a family! Congratulations! I love stories like yours. They give me hope and keep me on track. You and your husband are rock stars! Congratulations, the two of you are such an inspiration. Wow. What a huge accomplishment. I have been trying to figure out how to do this as well – except with one income and living month to month makes it near impossible to pay anything off, never mind just keeping afloat – but I will keep trying. Your blog has been a huge inspiration. Way to go!!! Congratulations on the amazing accomplishment and your years of testimony. Inspirational to see you and your family steward what you’ve been blessed with so effectively. The fact that you and your family are tithers in the midst of your debt is all the more inspirational. Enjoy the ‘used to be in debt’ club and many blessings as you move forward with the house search. This is not a plug for the service, since I haven’t used it, but you may want to check out naca.com as a couple of our friends have used it to get homes without down payment. It’s not that helpful (IMO) to get a home in the Bay Area proper, but in other parts of CA it might be of better use. Thanks for the kind words and the tip Kofi! I will definitely look into it! I have been so encouraged by your story. Each month I excitedly tell my husband how much you have paid off and this morning before he left for work I told him you did it! We are down to 72k left to pay off our California home and one acre. I feel excited for it but also know how much hard work is left to go. We will be excited to hear about your savings for a home. For now just enjoy the rewards of all your hard work! AMAZING! So excited for you guys! Welcome to the debt free club! It’s a great feeling! Congrats! Hooray hooray hooray!! My husband finishes vet school in May and then we can start aggressively paying off the debt (probably a little over $160,000.) We’ve talked about what our goal date is for paying it off but since we don’t know yet where jobs will be available, it’s hard to plan anything really. Other than smashing this debt! I feel really blessed that school debt is all that we have, no car or credit card. I’ll definitely continue to use your blog as a resource in the years to come! Thank you so so much for documenting EVERYTHING! It’s truly inspiring and I love the graphs and charts as well! What a wonderful achievement, one that has benefited not only your family but also the family of like-minded people you’ve built. Congratulations! A tremendous achievement which will have affects for years and years. Think of the lessons your children have learned; they sound like very unmatetialistic kids who enjoy life and family first and understand generosity of spirit. I’m in UK and there are huge problems of debt amongst families here. I wish they could all read your inspiring blog. I never realised until I read your blog that I’ve always lived on last months income— I didn’t know there was another way. Congratulations! That’s a massive accomplishment! Amazing!!! I have enjoyed your monthly updates and been inspired by your positive spirit. Congratulations to you and your family!!! You should do your debt free scream on Dave’s show!!! I am sooooo proud of you guys!! You have worked so very hard and sacrificed and you should be really proud too!! Now, onto the next goal which I am positive you will achieve!! You have been quite an inspiration to me so thank you and keep sharing!! Congratulations! This is just so exciting! I’m chugging along right with you. Yesterday I opened up a Roth IRA. I need to build up an emergency fund first, but then I’ll be saving for a house! YAY! I’ve been reading your blog for a long time. I remember when you posted about finally telling your family about your blog. It has been so encouraging. Congratulations on reaching your goal! Congratulations!!!! This is so exciting!!! So proud of you guys! Your blog is such an inspiration! Thank you for sharing all the ups and downs. Congratulations! I was looking for this post for the last few days, and it’s great to read the details. That’s a great post. Congratulations on paying off the law school debt! One more lawyer and family is FREE! Congratulations on staying the course! Congratulations Stephanie and family! I’m very excited for you. I hope that you enjoy the new bikes and camping equipment. You should be so proud! I’ve been watching from the beginning (or close to it when we joined the same blog tribe) and I thought it would take you much longer than it did. You are an incredible example for persistence and perseverance. Thanks to you, I use YNAB and I have been way more responsible with my personal budget, as well as my business budget. Please keep blogging and sharing your insight. Your passion is contagious!! I’m so very happy for you! I’ve subscribed to your blog for awhile, but really didn’t feel like there was anything new for me, just a few good recipes or money saving tips. But I really feel like “I’ve been there, done that” We’d already done Dave Ramsey, we use YNAB, and even vacation with Airbnb. So I don’t know why I subscribed or why, just a few weeks ago I started paying attention to your blog, but I’m so thankful that I did! Your 7 day crash course got me focused again after being in la la land for a very long time. We chose la la land because reality was so overwhelming! But I’m off to a good start (again) with new and better mentors (you for one) and now that it’s on paper… Over $512,000 for us… I’ve got hope. Isn’t that funny? Staggering debt and hope at the same time. And I owe a lot of that hope to you and your willingness to put it all out there and share your experience with me, a total stranger. So while paying off $144,000 in debt is awesome for sure, please know that what you have accomplished is so very much more than that! Thank you thank you thank you. I hope that one day as you are puttering around your comfortable home, basking in your beautifuly debt free life, loving your kids and maybe even grandkids, you’ll hear a little beep that means you’ve got a message and you’ll open it to see that I too have finally made my final payment and have acheived the dream that became a vision when fueled by your amazing experience. Well done. You have all worked so hard to get here. I have a similarly insurmountable goal of approximately $98,000.00 in student loan debt. (This is down from $104,000 a couple of years ago; it’s my fault…it should never have gotten that high but poor planning and deferring my debt while I traveled through my twenties allowed the interest to rack up.) I am 30.5 and have a debt free date of my 35 birthday. While that amount should not seem insurmountable for a single, frugal person, I am also a full time student, and will remain a full time student, through my goal debt payoff date. While I initially thought this seemed impossible, and like a goal that I shouldn’t even attempt, your blog has inspired me to be bold. To set the goal and to work my tush off for it! CONGRATULATIONS! You and your family are so inspiring! I wish you all the very best! As caveats to anyone reading my above post…. *I refuse to incur any new student loan debt. I want you to know that I graduated almost two years ago now with a PhD and ~93k in student loan debt. Thank you so much for your comment and for your support! I went to an expensive undergrad (Ivy) and many of my friends are rich (they came to school rich or got rich after) and have very different values than I have. I don’t want to be rich…just to be able to take care of myself and my parents should they need it. And I would prefer to teach at a access university or community college than the type of university I attended. (No interest in the R1, tenure track, “dream.”) Many have tried to discourage me from continuing down the path I am, particularly due to my age, so it is incredibly heartening to hear from someone who has been there. You have no idea…thank you so much. Also, @TBF, CONGRATULATIONS! Shaving down half of your debt in a year and half is AMAZING! That is so fantastic! Congratulations! CONGRATS!!! How exciting! I wouldn’t know how to feel, but all of you should feel so wonderful about this. Thank you for documenting your journey for all of us still fighting the good fight! I’ve been following along almost since you started blogging and I am so very happy for you! Congratulations on this big accomplishment! Thank you for sharing your journey. It has been so inspiring. The bikes are excellent! Congratuflippinlations!! So awesome. What a great feeling. Pretty soon you’ll have to rename your blog Six Figures Over. Eh, eh?? Fantastic news for you and your family! You should be very proud of yourselves for all your hard work and determination. You achieved an amazing goal. All the best for your debt-free future. Congratulations! That’s really amazing! I bet you feel so free. Congratulations! We have paid off $68,000 ourselves. Thanks for letting us follow along! Am looking forward to following along, as you slay your next goal of home ownership. Congratulations! I’ve been lurking for a couple of years and while our money philosophies were very different it has been great to see your journey. Congrats! I am SO excited for you and your family. I’ve been quietly following this blog since I’ve decided to pay off my own six figure student loan debt. Your monthly payoff summaries give me all the motivation to keep going. Thank you so much for everything that you’ve done and congrats again! congratulations! I am so happy for you and have enjoyed following your journey. I can’t wait to see what you do next with your money goals. Congratulation Six Figures Under Family!!!! SO, SO, SO HAPPY FOR YOU!!! I started following your blog in the beginning of 2014 and since then am constantly floored and amazed by your dedication and untiring spirit!! Around that time we started our own journey of paying off considerably small debt (yet it dragged for years) and saving for a house. We’ve achieved quite a lot by now (not there yet), mostly by budgeting and hard, long hours work, but you have been a huge inspiration!!! And we thank you! So excited to see what’s next for you. Enjoy this and GREAT JOB!! Congratulations, Stephanie!!! You’re an inspiration to all of us. I am so blown away by your dedication and success! I am so happy for you guys! You really are an inspiration to me. I love reading your blog to find encouragement and great ideas. You introduced me to YNAB which has been such a game-changer for our family! I can’t wait to keep following your journey now that you are debt-free. Congratulations! I have to say, following you guys for a while has really augmented the way I think about finances. I don’t say “changed” because my husband and I were already frugal to begin with. But all the tips, perspectives, and math posts really got the brain thinking! Right now, we are working on paying off our house. I had always said I would pay extra and own it early, but that was always in the terms of “$X-amount extra each month” rather than “every extra penny” goes to it. Since I have been using YNAB, I have generally been putting more towards it than I would have with the ‘$X-amount” figure I had had in mind. Anyways, I just wanted you to know that your journey changed yet another person, and I thank you for that. Congratulations! I’ve been reading your blog (almost) since the beginning and your debt repayment updates each month are some of the posts I look forward to the most. I’m excited to hear about your plans for a house! Congratulations! It’s incredible how much dedication and focus you have demonstrated these past few years. I am always inspired by your posts, and have cut a lot of our expenses by implementing some of your techniques! It’s crazy how all of those little payments really do add up and keep you moving towards your goal, even when sometimes it feels like we are standing still. Thanks for all of your openness, look forward to this new chapter. I almost never comment on blog posts but this is such fantastic news I feel compelled to! Congratulations! Your family’s story is inspirational. Congratulations!!! This is an awesome testimony and I hope you plan to share it with Dave Ramsey. I so appreciate that you took us along on your debt-payoff journey. I’ve learned so much and it’s been exciting on this end too to see your debt number decreasing. Thank you both for your transparency which has helped so many and will continue to do so. ENJOY your new status!!!! I’m so proud of you all, Stephanie! It has been so exciting watching you inch toward your goal. FYI Amazon also has 45% off all bike gear today so I thought of you !! Walmart .com and Amazon have the Allen Sports aluminum 2 child Bike Trailer/single and double swivel Wheel Stroller for $199 regular $399! They have the Schwinn Deluxe child carrier for $48.99 regular $64.38 and the Instep Quick and EZ Double bicycle Trailer for $79.99 regular $117.76. Again, Congratulations for reaching your goal! I’m late responding to this Jennifer, but I saw it on the day you posted it and I did check out Amazon. I had ordered a bike trailer the day before, but I did get two adult helmets and a new seat for my husband’s bike that were great prices because of the daily deal on Amazon. Thanks for the heads-up! Wow!!! You did pay off earlier than projected too!!! Fantastic!!! So very happy for you and your family! Stephanie, you and your family kept husband and me motivated to keep pushing hard to pay off our remaining debt. I found your blog last January about the time we made a crazy decision to pay off our house – our remaining balance was about $5,000 more than your balance at the time and we figured if you could do it, we could too! Like you, we were able to pay off earlier than projected…11 months earlier!!! The struggle and sacrifices were so worth it. You never know what will happen until you try! Thank you from the bottom of my heart for sharing your story. Midori that’s so exciting that we on track together and both finished early. Big congrats to you too! Thanks for always being so encouraging! SO excited for you and your family! I have been following your blog for some time now and have enjoyed your “real life” approach, I look forward to seeing your goals for the future and reading your blog to help keep me motivated! Congrats to you and your family! I have been following your blog for a while now, (probably a year) so your progress has been inspiring. We took out a loan to remodel our 1970’s ranch and have been struggling to get it paid off. (over 100K) I wish I had your willpower to not spend on non-essentials but I am in a totally different season of my life. 1st child off to college this fall. Anyways, I will continue to follow you as your no nonsense approach keeps me centered. Thanks again for your hard work and congrats on reaching such an amazing big goal! WAY TO GO!!!! I am truly excited for your family. What an exciting thing to be celebrating. I can only imagine your feelings of freedom right now, but someday soon, I will know what that feels like also. We have been paying down our mortgage and your journey has helped keep us motivated. Looking forward to your new goals and following your journey to victory with those also. Congratulations! You must be so proud, what an amazing accomplishment. I’ve been following your blog for about a year and you were my impetuous to try (and love YNAB). Looking forward to what you and your family will do next. CONGRATULATIONS! I have come to your blog and website fairly recently and am still trying to get past the denial to find out what my total debt is. Divorced after 40+ year marriage to a spendthrift and for the first time every I received an utility deposit returned to me- baby steps. Congratulations! Thank you for sharing your amazing journey. You are clearly an inspiration to many! Following along with your blog provides continual motivation for me. I’m looking forward to what lies ahead, like Mark (above) said “six-figures-over”! Enjoy your new freedom! And the bikes might seem silly, but we are SUPER excited about them! I’ll post pictures soon! Congrats! That is quite an amazing feat! I am sad I just now found your blog, I’m sure it was an amazing journey to witness in real time. Truth be told, I found your blog when searching for a domain name for mine. Your story really resonated with me because my husband and I are on a similar path, only about 3 years behind you. I am so happy to see that it is possible, thank you for proving that. Your story is truly an inspiration. I’m not sure what I’m most impressed with, you’re ability to pay off that much debt so quickly, or the guts you had to set such an ambitious goal with a relatively small income (at the time) – what a great example! And congrats for living on last month’s income – that is a good feeling! Congratulations!!! That is amazing! I’m very envious (but not jealous!) and can’t wait to find myself in the same situation! With so many people today complaining about their student loan debt and defaulting on payments, your family is a true inspiration and you should all be so proud of your accomplishment! Congrats!!!! I am so happy for your family, and so proud of you guys that you worked together and are finally reaching this milestone. We have been riding the roller coaster with you. On September we will be finished paying off all or our grad school loans. We will have paid off our credit cards, cars, undergrad and grad school loans! Yay! Thank you for your constant inspiration and accountability!!! Congrats to you and your family Ms. Stephanie! I have to say that I admire the way that you and your spouse were handling debt and I just though that it will take forever but then that you guys prove to me wrong which it made me inspire to help my mother’s credit card debt and other monthly expenses despite that I also have variable income with my side gigs (auditor and independent contractor which these two were project based from time to time) Right now that I’m figuring out with my third gig either be a field researcher or a flipping stocks due to my finance background for as long as anything goes. More Power to you and your family and sending love from the Philippines! Thank you Monique! It’s amazing what you can do when you put your mind to something. I never thought we would be done early! I agree which I couldn’t imagine on how can you and your family pull it off but you did it so well. Your journey to be debt free reminds me of an advice of a pastor regarding on how to eat an (proverbial) elephant is to eat it in small yet manageable bites which you are a shining example although that it applies on stock investment yet I believed that it can applied to debt management as well. YAYAYAYAYAYAYYYYYY!!! I think have been reading since you were about 80k in debt, and I have loved watching you guys sacrifice and WIN! So proud of you!!! I’m new to your blog and I’m looking through it. I want to know why your graph explicitly shows your income jumping from 4k to 8k to being over 18k per month in the span of half a year. And no where does it mention how you were able to reach that kind of money over a short month period. I dont think swagbucks can get you there haha. Hi Maria! You can look back at the archives of our monthly reports at any given month to see exactly how we earned the income from that month. Last Fall, my husband got a new job, so there was an increase in income there. He also started his own private law practice on the side last fall, so that brings in extra income (that fluctuates greatly). I am a stay-at-home mom, but I earn an income from blogging. I send out a blogging income report if you’re interested in the details. I just stumbled onto your blog and I am obsessed! I am actually a recent law school grad (a year ago) and my husband just graduated medical school a few months ago so we KNOW high student loan debt. haha. This is a huge inspiration because contrary to popular thought (as you both know) lawyers don’t always make truck loads and doctors have this middlespot called residency that doesn’t make them flush with cash. 😉 It also isn’t the norm to find another couple with a pretty monumental amount of student loan debt with an intense goal and it’s hard to be motivated by someone paying off their 20k balance when ours is like 10x that. Anyway, we just started our journey to pay off $214,000 – preferably before starting a family and buying a home and I’m pretty excited to read about your other suggestions for getting it done. A.S.AP. ! Thanks so much for sharing your story Stephanie! It’s very inspiring and it gives me hope that if we can stay focused we can also pay off our debt as well. It’s time to be debt free!! Hi Stephanie – i’ll be bookmarking this page from now on and use it as inspiration for my own journey 🙂 God Bless you and thanks for being an inspiration!!!!! Here and there. It just feels so insurmountable and we don’t know where to start. Our stories are creepily similar. I also graduated in May of 2012 with about $120k in law school/mba debt, started off in the IBR payments, finally had the courage to check my total balance in October of 2016, to see it had ballooned to $146,400! My wife and I learned a ton about personal finance (primarily through Mr. Money Mustache) and as of today we’ve paid them down to $112,000, while having our first child in February. My goal is to have them all paid by January of 2020, which my wife thinks is impossible – but if you’re obsessed with something badly enough, your mind might just will the result into reality (or so I’m hoping!). Just subscribed to your newsletter, hope to learn a few things and help me reach my goal. Enjoyed the story about your journey!!! Late in saying congratulations, but your story has been inspiring for me to become debt free as well. I can finally say that I’m debt free too!! It feels so good to say that! !